COVINGTON, Ky. -- Health officials in Cincinnati and Northern Kentucky have extended an Ohio River advisory issued prior to last weekend's Labor Day Riverfest activities. According to authorities in Hamilton County and Kentucky, favorable conditions have persisted for potentially toxic blue-green algae blooms. The description of what they look like speaks for itself: thick mats or scum on the water surface. It might also look like spilled paint that's bluish-green, bright green or even red or maroon. Blue-green algae usually blooms in lakes, ponds and slow-moving rivers under the right conditions: lots of sunlight, warm temperatures and excessive phosphorus and nitrogen in the water. In other words, exactly what we've had lately. Only some types of blue-green algae are harmful, causing a rash, hives, diarrhea, vomiting, abdominal pain -- with more severe symptoms possible depending on exposure level. Swallowing contaminated water, inhaling water droplets and skin contact are all ways people can be exposed to blue-green algae toxins. An advisory means toxin levels exceed the recommended threshold. Swimming or wading is not recommended for the elderly or very young and people with compromised immune systems. Pets and livestock can also get sick from exposure. Health officials emphasized this is a recreational advisory only, and that drinking water should be considered safe. While there have been no detected microcystin toxins reported in the finished, treated water from public water systems which draw from the river, additional precautions are also in place at water treatment facilities along the Ohio River front, according to the Kentucky Department of Water. On Aug. 31, KDOW received a report of an algal bloom on the Ohio River near Greenup, Ky. Subsequent sampling of the river indicated higher levels of microcystin toxins existed in some areas of the Ohio River from Ashland, Ky. to the Meldahl Dam. Since that time, conditions favorable for the development of HABs have persisted throughout the river basin, and additional HABs have formed further downstream. 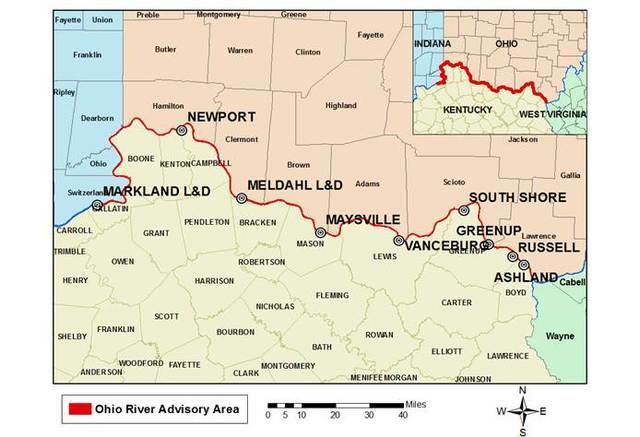 Analysis results received Friday indicated the need to extend the Ohio River recreational advisory beyond the Meldahl Dam to the Markland Dam area. “Signs are being posted at boat ramps warning people that high levels of algal toxins have been detected in the water, and that swimming and wading are not recommended for the very young, the very old and individuals with compromised immune systems,” said Tim Ingram, Hamilton County Health Commissioner. To stay safe, you should avoid water that looks like spilled paint; has surface scums, mats or films; is discolored or has colored streaks; or has green globs floating below the surface. If you plan to eat fish caught from the Ohio River, remove the guts and liver, and rinse fillets in tap water before eating. Activities near the river such as camping, picnicking, biking and hiking are safe. If you are picnicking, wash your hands before eating if you have had contact with river water or shore debris. If you're on the river, you should rinse off as soon as you're finished swimming or boating. And if you or a pet gets sick, contact your doctor or veterinarian.